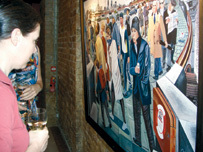 It was a hot Friday as I stepped off a Southwark street straight into a Mayfair art gallery. It was like going backwards on a Monopoly board from Old Kent Road. But this was not Mayfair, this was the newly refurbished and looking good GX Gallery in Camberwell; all big windows and bright lights. It was also the opening of local artist Ed Gray’s new exhibition of works, Transmetropolitan, as he takes another deserved step up the artistic ladder of success and critical acclaim. 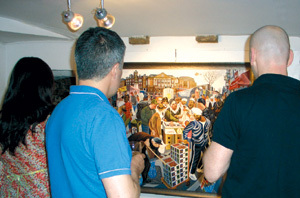 The theme of the paintings is a journey through busy London, taking in the underground, City commuters, markets and train stations, depicting all the cultures and characters that make up our glorious capital and its incredible cityscape. Everyone who is anyone was there: Beth Elliott, Chair of the Bermondsey Artists’ Group, Rob Wray, big cheese at Shortwave Films and soon to be Guv’nor of the new cinema in Bermondsey Square, Southwark’s high priestess of academia Dr Evans (Gillian to her friends) and Nita Karia, erstwhile stalwart of BOSCO, now running IT at the WEA. Plus humble me, trying to hold my own in such distinguished company. With so many people crammed into the 1st level it was, as Ms Elliott so succinctly put it, an art sauna. Then the artist made his unpretentious welcoming speech, thanking his wife, his mum and the gallery for their love and support, before the lower level was opened and we could find some cooler air as well as the bulk of the exhibition. We were all there knowing what to expect from Gray’s work, but every year at every new show he still comes up with more surprises. I stood back and listened to the adjectives being laid on as thick as the acrylic: Amazing! Wonderful! Brilliant! Around me the crowd were totally complimentary: ‘The attention to detail is sooooooo meticulous,’ mewed one disciple… ‘Fantastic use of colour,’ purred another…’ Like freeze-frame photos with movement….’ And so on. In his unassuming speech Gray apologised for there not being as many paintings as he would have liked, explaining that he had destroyed four that he was not happy with. But there was ample work to view with drawings, prints and sketches for sale alongside the original paintings. Plus, something that has become a tradition, the paint-spattered boiler suit that he wears in his studio to work, and renews every year. And sales went well. Gallery staff were scurrying around putting red Sold stickers on the work quicker than we could get round to view them. One potential buyer actually running through the gallery crying before each work: ‘As this one gone yet?’ before claiming it for her own collection, or clients. As always Ed Gray’s show is an absolute treat. It is one I recommend you don’t miss.